LOS ANGELES—Freddy, a co-production launching a collaboration between the Fountain Theatre and Los Angeles City College’s Theatre Academy, tells the story of real-life dancer Freddy Herko (Marty Dew) largely through choreography (by Cate Caplin) and a recorded soundtrack of music ranging from Vivaldi and Mozart to sixties music by Blind Faith and Donovan plus other rock/pop musicians. Various stage effects are used, too, including a sort of mist that this circa hour-long play opens with, perhaps symbolizing the mists of memory. To be sure, in addition to this impressionistic collage, there is a storyline that threads this needle, as the older Shelley (professional actress Susan Wilder) goes back in time to relate her experiences with Freddy, when she was young and foolish. Devoted to dance, younger Shelley (professional actress Katie McConaughy) leaves her husband Pete (LACC sixth-semester actor Lamont Oakley) to pursue the mercurial Freddy. However, while he may dance divinely and be beautiful, as far as blissful cohabitation in Shelley’s Greenwich Village pad goes, there are two flies in the ointment. Despite Herko’s initial promise as a dancer, he is steadily destroying himself through an addiction to drugs—primarily speed, which he shoots up. And oh, by the way, he is also gay, so it’s hard to decide who acts more self-destructively, Freddy or Shelley (who is apparently the alter ego of playwright Deborah Lawlor, co-founder and co-artistic director of the Fountain, one of L.A.’s most renowned intimate theatres). Lawlor’s play, directed by Frances Loy, provides little insight into what made Herko tick. (It also depicts Shelley’s marriage as being interracial, but never so much as comments upon this, although it was fairly rare at the time.) There is a sort of Balinese shadow puppet play projected on a screen that depicts Freddy’s announcement to his parents that instead of becoming a concert pianist, the Juilliard student intends to be a dancer. His father overreacts violently to the news: In context, in the 1950s and early 1960s, a male’s announcing he wanted to dance could be tantamount to coming out as gay at a time when this was still extremely taboo. But other than that, Herko’s literally throwing away his talent in a most dramatic manner seems inexplicable. So unless one is attracted to him and/or the actor portraying him, little reason is given for viewers to sympathize with this substance abuser. Toward the top of this world premiere there is a frolicsome scene at Andy Warhol’s “Factory,” the pop artist’s studio on East 47th St. in Manhattan. 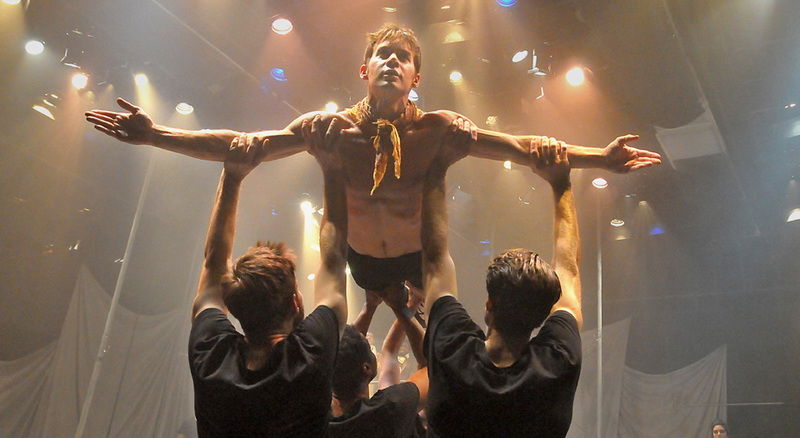 A party there features lots of shirtless men running around the stage in this play full of homoeroticism that seems to deliberately downplay the sensuality of the female cast members, many of them LACC students. This brought memories of that colorful, countercultural subculture back to this native New Yorker, who once saw Warhol walking a pink poodle on a leash in Manhattan. Herko, who was reputedly quite good looking, appeared in several of Warhol’s experimental films. The playbill’s silkscreen-like color photos of Dew by Ed Krieger have a Warholian panache. But instead of being a strongly recurring motif in this bioplay, one of the most interesting parts of Herko’s real-life story, full of outsized, outré personalities, is quickly sidelined. There are references to Warhol, although he is never depicted. 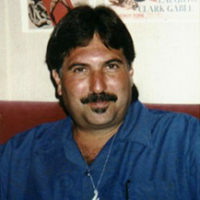 Herko is shown as being the life of said party Factory, so perhaps portraying many other outlandish characters throughout the one-act would have diminished Herko’s avant-garde stature in this drama. It is an interesting piece of theatrical time travel to have a character’s older self observe her younger incarnation (depicted by actors of different ages), reliving events from long ago. Especially in a play that is strongly autobiographical. It appears to be an act of self-reflection, wherein one looks back and tries to understand what was, what was not, and what could have been. Herko could have been a Herculean hoofer but instead became herky-jerky. What a waste! Artists have a responsibility to themselves, their audiences and their art. Perhaps Freddy rationalized his use of speed as a way of fueling his style of dancing, but we’ll never know for sure—even after seeing this play, which doesn’t explain Freddy’s motivations either. The Fountain Theatre and LACC Theatre Academy present Freddy on Weds., Thurs., Fri. and Sat. at 8:00 pm and Thurs. and Sat. at 3:00 pm through Oct. 14 at Caminito Theatre, Los Angeles City College, 855 N. Vermont Ave., Los Angeles 90029. Parking is free in structure 4 on Heliotrope at Monroe (between Santa Monica and Melrose). Info: (323) 663-1525; www.FountainTheatre.com. Rampell is a co-organizer of the 70th Anniversary Commemoration of the Hollywood Blacklist.